I offer a fast turn around bow re-hairing service, using finest quality white Mongolian horse hair. I also undertake all other bow repairs, such as grip replacement, screw repairs, stick repairs, refinishing and re-cambering. When to get your bow rehaired. There is no easy answer to that, it depends very much on your playing style. Some people find they need a re-hair every 2-3 months, others can go for a year or more. 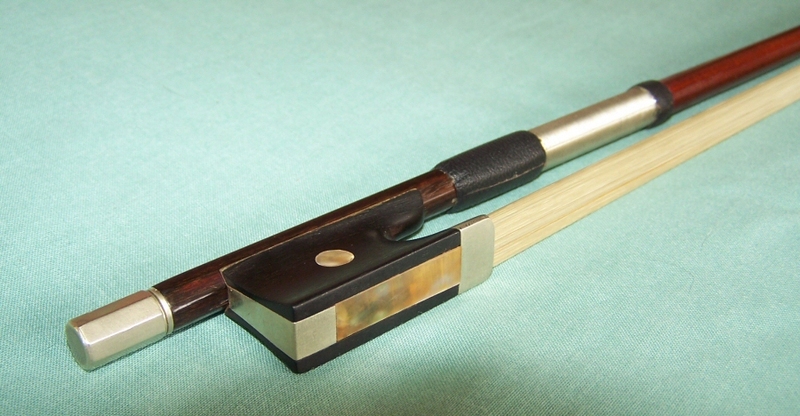 If you are one of those players who break a lot of hairs you should think about getting a re-hair when the ribbon is down to about 2/3 its original width, and if you have lost a lot of hair from just one side of the bow you should certainly get it done – the uneven tension may permanently warp the stick. Even if you don’t break a lot of hair, it eventually loses grip. If you find your bow isn’t gripping the strings as it should it may be time for new hair. But excess rosin can also cause loss of grip, so before you commit to a re-hair, try giving the hair and strings a good wipe with a dry cotton cloth to remove excess rosin, you may find that improves things for a while. If you are using the bow that came as part of a set with a student violin, it won’t be worth getting it re-haired. You can buy a brand new bow of comparable quality for under £10 on Ebay – about 1/3 the cost of a re-hair. But if your bow needs replacing, why not consider upgrading? You’ll be amazed at how much your playing may improve with a better bow. For under £100 I would recommend a P&H carbon fibre bow, I know one orchestral player who uses one of these in preference to his £1,500 pernambuco bow.